Wolf Vostell, Concrete Traffic, 1970. Campus Art Collection, The University of Chicago. Photo by Michael Tropea. Art © The Wolf Vostell Estate. Wolf Vostell (1932-1998) might not be a readily-recognized name today, but - primarily from the 60’s -to- the 80’s - he was known as one of the world’s most creatively provocative artists. He often made stimulating & challenging visual statements by incorporating the products of industrial civilization - cars, motorcycles, planes, and [especially] televisions - into his work, and he’s reputedly the first artist in history to integrate a television set into a work of art. Even if less known today, Vostell might be familiar to the generation of architects educated in the 1970’s, as he was co-author of the 1971 book Fantastic Architecture - a wonder-filled little compendium of artist-generated projects with architectonic flavor. The simple-minded think that Brutalism is just about concrete - but we know that’s not even close to accurate. Even so, it is often-enough identified with concrete - and that’s where the intersection with Vostell comes in. The man had an intense relationship with both cars and concrete—and in a number of his works, he encased whole automobiles in the material. 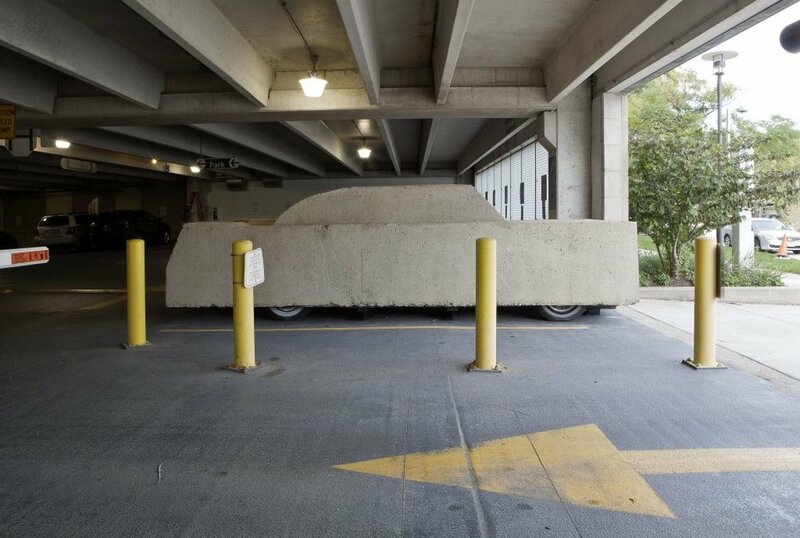 One such example is his 1970 artwork, “Concrete Traffic”, now located in a garage in Chicago: it is a 1957 Cadillac, to be precise, which is entombed in 15 cubic yards of gray loveliness! It’s an extraordinary sight - Brutalism that looks like it’s about to speed off! - and additional views (and more) can be seen here. A rear view of Vostell’s concrete car. Photo by Michael Tropea.